Grab the opportunity to blend with nature in Duarsini, where you will find small hilltops covered with forests. Here you see a variety of trees like Shal, Teak, Mahua, Pial, Kusum, and Bahera. The beauty of the mountain river Satgudum leading to the tribal villages will enchant you. The adventure waiting for you in the forest will definitely make your weekend worth spending in Duarsini. Places to see at Duarsini: The major attraction of this place is the villages of tribals like Santhal, Munda, Shabaradh, and Kheriya. Then the jungle is another interesting place to visit, where you see wild animals like bears, wild pig, and herds of elephants, hyena, and wolf, along with some known and unknown birds that can be seen here. Nearby attractions from Duarsini: Galudi is a place that can be visited from Durasini, and from Galudi you can further travel to its nearby destinations. Another place is Bhalo Hills, which is some 3 km from Duarsini. Here you can see remnants of the culture of some past civilization. Things to do in Duarsini: In Duarsini, you can travel to the various tribal houses in their villages, of course guided by some local. In the jungle you can even spot some wild animals. Sitting by the river Satgudum is also an option. 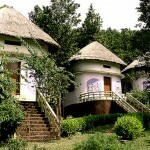 In the evening you can also sit in your bungalow and enjoy the sound of drums coming from the tribal villages. How to reach Duarsini: The easiest way to reach Duarsini is by traveling 12 km from Galudi and crossing the border of West Bengal and entering Purulia district. Duarsini can be arrived at both from Purulia as well as Bandowan. Best time to visit Duarsini: The jungles are safe throughout the year except the rainy season. Lodging and dining facilities at Duarsini: The best arrangement for lodging is the cottages maintained by Forest Development Nigam. Dining comes as a part of staying in these cottages.